At North Andover’s Annual Town meeting on May 19th, we urge the voters of North Andover to reject a proposal that would lower the town voting age to 16. Such a move would not only harm the town, but it would also set a dangerous precedent for the rest of the state. Sixteen and seventeen year olds, for the most part, simply do not shoulder the responsibilities, or possess the life experience and the investment in the community that is necessary to make informed and reasoned choices regarding issues that affect the legal and financial future of the town. Children of this age are unable to enter into binding contracts, including rental agreements, leases, car loans or mortgages. Sixteen and seventeen year olds cannot obtain credit cards. They are unable to serve on juries, where their decisions could determine a person’s freedom or imprisonment. These are only a few examples. These are all basic examples of the responsibilities of adulthood and citizenship. If we believe that children of this age are not mature and responsible enough to shoulder these responsibilities, why would we entrust them with a vote which would not only affect them, but every citizen of the town as well? Teens don’t pay property taxes in town, either directly or indirectly through rents, and are the consumers of the single largest line item in our town budget; our schools. Allowing them to vote on this budget without any fiscal repercussions to themselves is certainly a conflict. In local elections and town meetings that are usually decided by just a few hundred votes they could easily sway the outcome, with potentially dire fiscal ramifications for the town. Our society did not choose 18 as the age where one is given the responsibility of voting arbitrarily. It was decided during the Vietnam War that if a person was old enough (18) to be drafted to the military to fight overseas, one was also old enough to carry the responsibility of electing those that could potentially send them to fight. This, the nation believes, is a reasonable line of demarcation between childhood and adulthood. We urge the voters of North Andover to let common sense prevail and defeat this irresponsible measure. So, teens are the most affected party of the single largest town program, and this is why they *shouldn’t* have a say in government? Interesting reasoning there. It is not true that no teens pay property taxes; I myself lived independently at seventeen and paid rent. And although that may be unusual, many young people work and pay income taxes, which through state and federal contributions to the municipal budget contribute to local services, including schools. Young people purchase goods and services and pay sales taxes, which similarly contribute to local services. Young people’s labor and purchasing power directly contribute to the local economy. Your economic argument is thus incorrect at best, intentionally misleading at worst. It is also pointless; it is not whether or not one contributes to the cost of a service that determines whether or not they should have a say in how it is run, but whether or not they are affected by it. (Did women not deserve the vote because most of them were not primary wage-earners and landowners in the early 20th century?) As you so diligently point out, schools are an important local service. Can you guess who is most impacted by the policy decisions affecting local schools? I’ll give you a hint: it’s not adults. Recreation services, another item of local policy concern, also affect teens disproportionately. Your argument that 16-year-olds should not be allowed to vote because they’re not allowed to sign contracts, hold credit cards, etc is circular and utterly meaningless, since these restrictions are all equally arbitrary. If a year from now, someone suggests a ballot measure that would allow 17-year-olds to sign contracts, will you be back arguing that such a thing is ridiculous because they can’t vote? 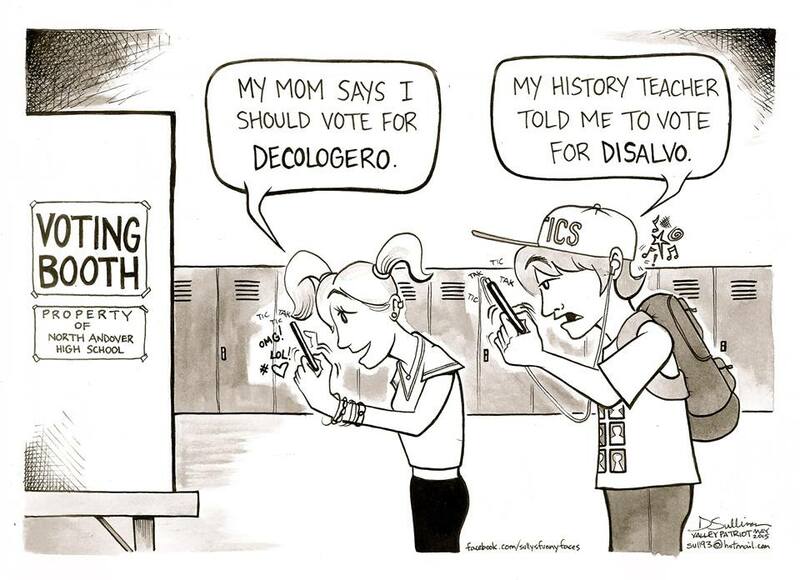 The political cartoon you have chosen to include is contrary to all research on the subject, which has consistently found that 16-year-olds are not more likely to vote the way their parents or other adults in their lives do than 18-year-olds or 30-year-olds. It should also, on the flip side, be pointed out that 70% of middle-aged adults in this country DO vote the same way their parents did; since this is never taken as an indication of their incompetence, one must conclude that your problem is not with families sharing political viewpoints, but simply with teenagers being allowed a voice in the political process that shapes their communities. What is irresponsible, ultimately, is to continue to force citizens in a country that owes its very existence to a rebellion over the issue of taxation without representation to spend the first eighteen years of their lives with no political representation despite paying taxes. What is irresponsible is to continue to refuse young citizens the right to participate in the process of deciding who will be representing their interests when issues that directly affect their lives are decided. What common sense dictates is that we welcome young Americans to take their place as part of democratic society. I think Mr. Duggan and his readers should consider that it’s far more irresponsible to make a decision to deny any particular group of people the right to suffrage in a democracy than the reverse. The history of the USA is a litany of different groups of people being presumed inherently incompetent to exercise voting rights based on arbitrary factors that assume lack of merit for the entire group — e.g., black people, women, people between the age of 18-21 — all of whom were eventually granted this most important of democratic rights (save perhaps for freedom of speech) once belief in their alleged inherent incompetency as a group was disproven. There has been more than enough science over the past decade to debunk the nonsense that youths under 18 as a group are inherently incompetent or inferior to adults. Please read Dr. Robert Epstein’s downloadable article “The Myth of the Teen Brain” (just Google it!) then move onto his book TEEN 2.0; and Dr. David Moshman’s article “The Teenage Brain: Debunking the 5 Biggest Myths” (http://www.huffingtonpost.com/david-moshman/adolescents-and-their-tee_b_858360.html), and from there move onto his book ADOLESCENT RATIONALITY AND DEVELOPMENT (3rd edition, 2011). Though this has been said before, I think it bears repeating here: If competency was a requirement for voting, and maturity (i.e., number of years on this planet) made such a difference in this competency, then respectively speaking, we wouldn’t have so many highly uneducated adults who are allowed to vote despite knowing next to nothing about the political process or the positions of the various politicians, or so many older citizens routinely voting against their own best interests and consistently making the same choices over and over again despite how such choices invariably out. Clearly there is something both factually incorrect and undemocratic about the “competence and maturity” requirement and assessment for voting based on an arbitrary factor like age… just as there once was in regards to race and gender. The two other commentators before me in this section did a good job of refuting the other non-factual statements that Mr. Duggan stated in his article, so I will not reiterate them further. Instead, I’ll close with this point: The major reason 16-and-17-year-olds, and younger individuals, are not allowed to sign contracts, work regular jobs, etc., is more based on legally-enforced bigotry than anything related to scientific justification. Age-based bigotry is one of the last instances of widely accepted forms of prejudice that needs to be excised from the democratic sphere, and I’d like to think the majority of Americans will do the right thing rather than the thing that grants their particular group (i.e., legally recognized adults) unfair and unmerited advantage over another group. We’ve done it before on more than one occasion, and I’m confident the majority of Americans can recognize their current prejudices for what they are and act accordingly. 16 is not adult unless works pays taxes legally recognised as an adult.